Apollo's Hegemony CDP Choline is a dietary supplement containing 300 mg of CDP-choline per capsule. CDP-choline, also known as citicoline, is a natural choline compound with nootropic and psychostimulatory effects confirmed by many clinical studies. CDP-choline (cytidyl-5'-diphospholine, citicoline) is a compound naturally occurring in the body, built mainly of cytidine and choline. It participates in the biosynthesis and repair of cell membranes, biosynthesis of proteins, nucleic acids and acetylcholine neurotransmitters. Following the discovery of the natural presence and importance of CDP-choline in the body, the compound started to be synthesized. Until now, the positive effect of the substance on the functioning of the brain has been confirmed by numerous tests and thus it has been registered as a medicine. CDP-choline is a natural precursor to phosphatidylcholine, a compound that is the main building block of phospholipids of cell membranes, including cell membranes of neurons. In the body, CDP-choline is hydrolyzed to choline, which is part of the phosphatidylcholine and cytidine molecule. Cytidine is transformed into uridine, which in the course of further biochemical transformations is transformed into cytidyl triphosphate (CTP), which is a key cofactor in the synthesis of phosphatidylcholine. Through its participation in the synthesis of phosphatidylcholine, CDP-choline stabilizes and improves the function of cell membranes and their components, including membrane receptors. This is extremely important with regards to proper neurotransmission and neuroprotection. Supplied by citicoline, choline is transformed with the participation of choline acetyltransferase into acetylcholine – the neurotransmitter of the cholinergic and (partially) sympathetic systems. The cholinergic system is involved in the formation of the so-called memory engrams, as well as in cognitive functions and plasticity of the brain. Optimal amounts of acetylcholine, as the sole neurotransmitter of the cholinergic system, are necessary for the proper functioning of the brain. When maintained at an appropriate level, CDP-choline effectively improves cognitive functions, ability to remember, learn and concentrate, also in case of age-related deterioration of cognitive functions, and increases the level of energy and motivation. As already mentioned, citicoline is registered as a medicine, which proves the high effectiveness of this compound. It accelerates returning to mental efficiency and motor functioning after stroke, improves cognitive functions accompanying dementia syndromes, as well as it positively affects memory and concentration in case of alcohol withdrawal syndrome and in elderly people. 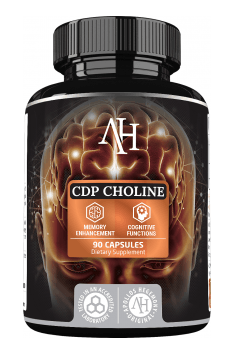 In summary, Apollo's Hegemony CDP Choline is a high-quality preparation containing a thoroughly tested and effective substance, supporting the efficient work of the brain. The product is recommended primarily for people performing intensive mental effort, to improve intellectual performance, and as an aid supporting concentration and assimilation of information and to improve cognitive functions in older people. Microcrystalline cellulose, rice starch, capsule shell. It prolongs action of other substances; regulates cholesterol concentration.